If we said that we had a steam trap that would permanently reduce the process plant steam consumption by typically 10 to 25%, that the trap had a 15 year performance guarantee, that the trap could significantly reduce maintenance costs, improve plant reliability, process stability and potentially increase production would you be interested? There are very few studies on the impact of failed steam traps on process plant running costs but we were once quoted by an engineer from a well known oil company that in one year alone they lost $20 million dollars due to unplanned downtime and of that $12 million dollars were due to trap failure! So even without considering the energy savings the Fenix Hydrodynamic Traps make sense. The simplest version of a hydrodynamic trap is the orifice trap but this is correctly associated with many problems. The Fenix Trap with venturi technology is designed to overcome the shortcomings of the simple orifice trap. Of great importance on low load applications (drip legs, trace heating) is the use of a carefully engineered strainer. The Fenix strainer has a double mesh with machined reinforcing rings to virtually eliminate dirt from passing into the trap. If dirt gets in the particles are so fine they will pass through even our smallest nozzle size. The inverted cone inlet prevents any build up of dirt directly around the nozzle. Because the traps don’t block we are able to use a very small nozzle for low load applications. This ensures that there is always a hydraulic seal. Since only water is passing through the stainless steel nozzle there is no steam loss and no erosion of the nozzle, hence the 15 Performance Guarantee. The venturi technology utilizes the flashing of the condensate to create a back pressure inside the trap that regulates the flow through the trap. The capacity of the trap therefore changes with the process conditions allowing the Fenix Traps to be used on all varying flow rate applications. Complete range of Fenix Hydrodynamic Traps to cover all process applications from low load drip leg and trace heating applications to high pressure process heat exchangers with variable loads. The product range consists of an EF (Easy Fit) trap that can be screwed or socket welded. This has the same face to face dimensions as a typical thermodynamic trap (the most common trap that this model will replace) so reduces installation costs. The QF (Quick Fit) is the Fenix version of the 2 bolt design that is widely used in refineries and chemical plants. The Fenix QF can be supplied with it’s own adapter or fitted to an existing adapter. The IVP (Integrated Variable Process) Trap is for high pressure process application and is supplied with socket welded connections. The main body of the trap can be removed for access to the nozzle if necessary. The FL trap is a flanged version of the technology and can be supplied in all sizes with a variety of different flanges, e.g. ANSI150, ANSI300, PN16 etc. There are standard length versions of the FL but the trap can also be fabricated to a specific face to face dimension to fit exactly the space of the original trap it is replacing and so reduces the need for spool pieces or expensive pipework modifications. 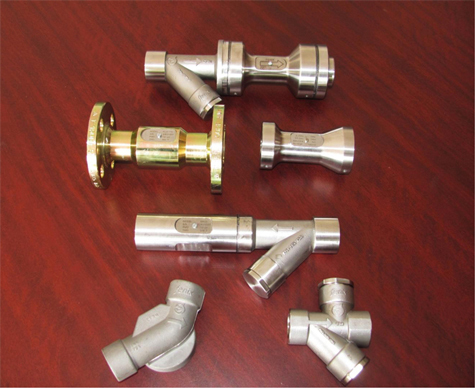 The AM is a process trap for lower flow rates and lower pressures with screwed connections. It is ideal for many application the food industry, pharmaceutical plants, breweries, etc. This is new and innovative technology and as with all new developments we don’t expect our clients to jump in at the deep. But it’s very simple, we just need to select an area of the process plant to install a few traps as a trial and see how they perform. The next logical step is to repeat the trial on a larger scale and assuming the results are replicated then convert the whole plant. As part of our services we provide detailed quote with all the financial information such as simple payback, Net Present Value, 10 Year Life Cycle costs, etc. PES has the responsibility to ensure that all the traps are correctly sized and are achieving the expected savings. A single trap doesn’t normally have a large impact on the overall plant performance but when all the traps are considered there is a massive potential to improve the plant performance and reduce operating costs. If you would be interested in benefitting from this untapped potential then we would be pleased to arrange a visit to your plant.